Version 7 of Legacy heralds the introduction of SourceWriter. SourceWriter is a template driven sourcing system that makes it easy for you to select the correct input screen so that you enter all the pieces needed to correctly cite any source of information in the thousands of formats that exist for them. The information you enter is correctly and precisely formatted to match the genealogy industry standards for source citations. Prior to version 7, Legacy's citation methods were rudimentary and straight forward but didn't offer the expert help needed in order to automatically produce correct citations. Actually, in version 7, you can use either of the citation methods, the new or the old. We will call the new system SourceWriter and the previous system the "Basic System." If you always want to use the old system, go to Options > Customize > Sources and select Basic System. To use the new SourceWriter system, make sure the option is set to SourceWriter System. From the Assigned Sources List from an Individual, Marriage, or To-Do screen, click Add a New Source. From View > Master Lists > Source, click the Add button. The first step is to select the proper source template that matches the source you are documenting. A source template is made up of all the potential pieces of information that you should record about the source. These include both the fields for the master source and the fields for the details of the citation. Some sources require only a few bits of information and others require many. There are two different ways to find the source template that you want to use. The first is by entering keywords to display the Source Template Index showing you all the templates that match your query. From there, you select the template that matches the source you are entering. The second method is to select the template by first selecting the general type of source and then choosing subcategories that refine the choice down further and further until you have the desired template that matches the source. These two methods are described in detail below. Begin by entering one or more keywords into the field and then click the Search button. This then displays the Source Template Index showing you all the templates that match your keywords. For example, if you entered Birth, the Source Template Index would show you a list of more than 100 templates. These would be grouped into four sections; Amended Birth Certificates, Baptisms, Birth Certificates, Birth Indexes, Database, CD-ROM, etc.. It would be fairly straightforward to then select the actual book type that you are dealing with. If you knew that you were citing a source from a short form birth certificate, you could have entered the keywords, Birth Certificate short form, the resulting index list would have only contained 6 birth record templates. As you use the Source Index more and more, you will get better and better at selecting the desired keywords that will make the template selection go more quickly. You can add or remove keywords from the search field at the top and then click the Search button to create a new list of matches. When you find the correct template, click on it to highlight it and then click the Go button. (Or you can simply double-click the template line.) You are then taken to the screen where you actually enter your source information into the template fields. See Filling in the Source Template below for more information. As soon as you have answered the last prompt in the series, the Go to Step 2 button is enabled so that you can click it to continue on to the actual source template. See Filling in the Source Template below for more information. 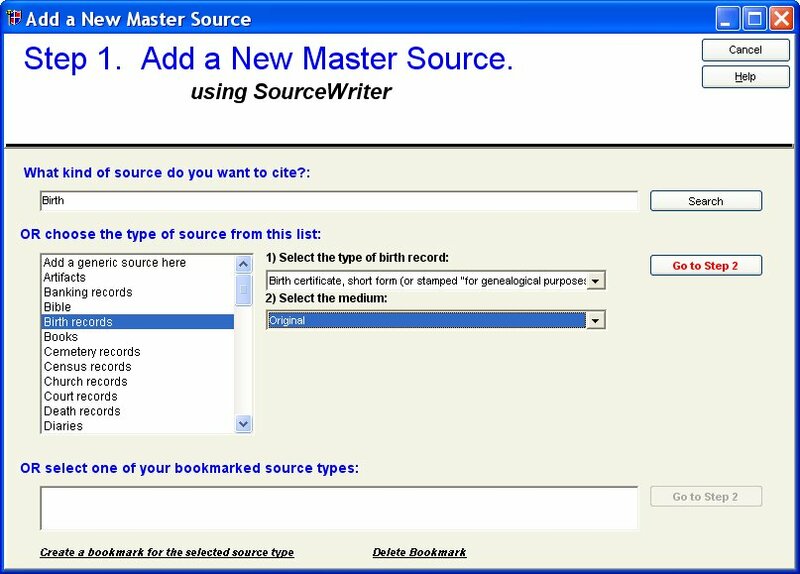 The second step to adding a new source using SourceWriter is to fill in the actual fields of the template for the master source. The name of the source template that you have selected is shown in the header. In this example it is: Birth records > Birth certificate, short form (or stamped "for genealogical purposes") > Original. It is a long name but it precisely identifies the template type and subcategories. Many names are shorter, some are longer. Below the header is the actual template. The first tab, Source Info, contains the fields that you will be filling in. The other four tabs, Text, Repository, Multimedia, and Overrides are included so that you can add additional information about the source as well as pictures and other items of interest. To the right of the input section is the Output Preview. As you enter the information about the source, it is instantly processed and displayed in three different formats so that you can see how it will look when included on a report or book. The Footnote/Endnote Citation output is used for the first occurrence of a footnote (at the bottom of each page where a source is cited) or endnote (at the end of each generation, chapter, or book) on a report. The Subsequent Citation is used in the same places as the footnotes and endnotes but uses a condensed format that doesn't require as much room. The Bibliography is printed at the end of a report and is a summary of all the master sources cited in the report and is shown in alphabetical order. Field Examples - Most input fields have some kind of instruction or example in gray lettering centered in the field. This text gives you a sense of what the field is for. When you click in a field (or tab to it), the example text disappears so that you can enter your information. Note: The example text is also shown as a tool tip when the cursor is held over the field label so that you can remember what the example was when you are filling in the field. Default Entries - Some fields have default entries. In most cases, this is what should remain in the field. You can replace it if needed. Locked Fields - Some fields have default text and are locked so that you cannot change the contents. They are actually part of the source citation output and are only shown so that you will know what part of the citation they are. Scrolling - If there are more than ten input field, a scroll bar is shown allowing you to manually scroll up and down in the field list. When you are entering information and tabbing down the list, it scrolls automatically for you. Master Source List Name - Enter a name for the master source record. This name will be used in the Master Source List whenever it is displayed. The source name is generally an abbreviation of the source title. For example, if you are working from a book called "Gilbert Radcliff Johnson of Wilderberry County, South Dakota and all Known Descendants Through 1945", you might want to name the source something like "G.R. Johnson Descendants." Text Tab - Here you can record actual source text and comments about the source. The text box can be a word-for-word copy of any description contained in the source. Don't enter opinions about the source by you or the compiler. This should only include "what the original record keeper said" as opposed to any interpretations. The Comments box is used to record notes for each master source you enter. This is a good way to document how you found a particular source and other interesting and important information about it. Embedding Formatting Codes into the Notes - You can add formatting codes to your source text and comments so that portions print in bold, italics, underline and superscript. These codes are used when printing reports, producing word processing files and Web pages. Repository Tab - Record the name and address of the place where this source is stored. It may be a cemetery, library, or archive. It can even be the address of another person who has a copy of the document. Multimedia Tab - Used to attach graphic files and other files to the source. These may be scanned images such as birth certificates, obituaries, sound files, etc. This is the date you recorded the source citation. You can assign your own filing number if desired. Verified - This checkbox is used when you have verified the source information. 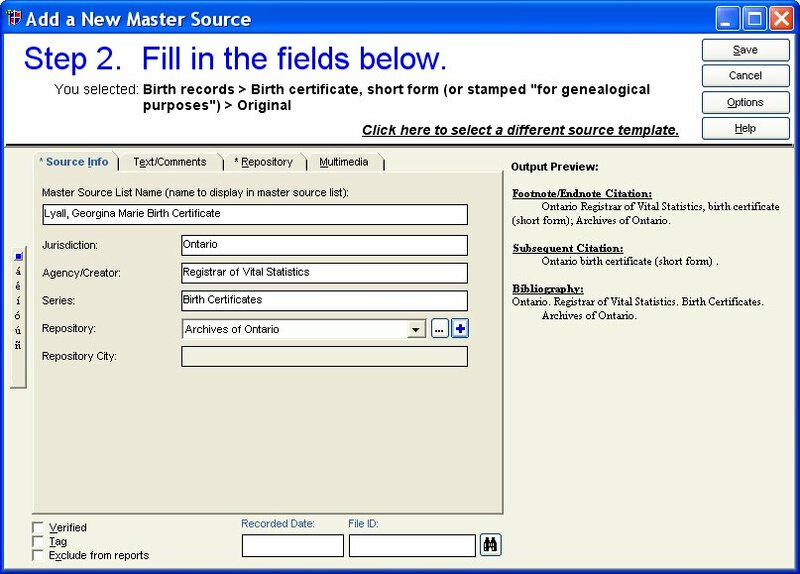 For example, if you receive information from another person, either through a GEDCOM import or by email or other means, you should verify that the source citations are true and accurate. As you check each citation, you can mark Verified to indicate your confirmation of the source information. Tag - Sources can be marked with a tag so that later you have the option to print only the tagged sources when doing a source report. Exclude from reports - Select this option to exclude this source from the footnotes, endnotes, and bibliographies when printing reports or books. Normally you will only want to print a few of your best and most reliable sources for each event on a report or book. You might have a dozen or more sources for a person's name, for example, but it doesn't make sense to include all of them on a report. The resulting footnotes end up very long and take too much space at the bottom of each page. In the header at the top of the screen there is an Options button. From here you can set the Font size used for the Output Preview by using the Zoom option. You can also save a bookmark for the current template so that you can easily use it in the future. See Bookmarks a few pages back. If you are adding a new source (as opposed to editing an existing source) you can go back to Step 1 and select a different template if you wish by clicking the Click here to select a different source template link in the header section. To save the source, click Save. If you are adding a citation, you will be taken next to the Detail screen where you can enter addition information pertaining to the particular citation of the source that you are making. This is usually a page number, item number, etc. The third step in adding a source citation is to fill in the detail information. A particular master source of information may be an unlimited number of times within a Family File. You might have found a book or bible that contains hundreds of family members. The location of each piece of information for each individual should be recorded. Rather than record the entire source description hundreds (or thousands) of times, taking up huge amounts of storage space, it is much more efficient to enter a general source description once, point to it in the master source list and record just the unique information for each piece's place within that source. 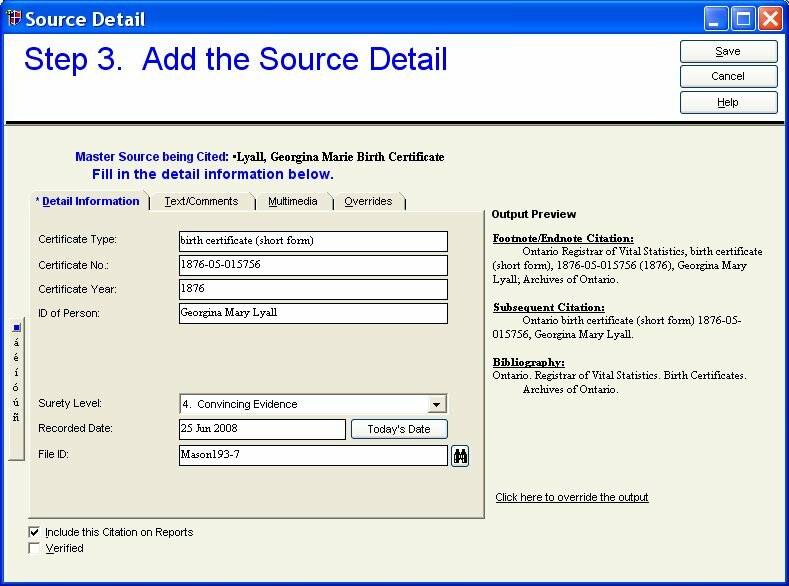 The Source Detail window is where you enter information about a source that indicates where in a specific source the cited information was found. Most source templates contain additional detail fields, that when filled in, are incorporated into the final output of the footnotes or endnotes. Detail Fields - Enter the requested information if you know it. These is usually page numbers, volume numbers, item numbers of a microfilm rolls, line numbers, etc. Surety Level - While specifying the source detail, you can also indicate the Surety Level of the information. This number, from zero to four, shows how sure you are of the information. Recorded Date - This is the date you recorded the source citation. File ID # - You can assign your own filing number to the citation if desired. Detail Text Tab - Here you can record actual source text and comments about the source pertaining to this citation. The text box can be a word-for-word copy of any description contained in the source. Don't enter opinions about the source by you or the compiler. This should only include "what the original record keeper said" as opposed to any interpretations. The Comments box is used to record notes for each source citation you enter. To the right of the input section is the Output Preview. As you enter the information about the source detail, it is instantly processed and displayed in three different formats so that you can see how it will look when included on a report or book. The Footnote/Endnote Citation output is used for the first occurrence of a footnote (at the bottom of each page where a source is cited) or endnote (at the end of each generation, chapter, or book) on a report. The Subsequent Citation is used in the same places as the footnotes and endnotes but uses a condensed format that doesn't require as much room. The Bibliography is printed at the end of a report and is a summary of all the master sources cited in the report and is shown in alphabetical order.